The hotel that inspired the hit series Fawlty Towers looks likely to close down, according to reports. The future of the Gleneagles Hotel in Torquay, Devon, is uncertain after councillors rejected plans to convert it into a retirement home. John Cleese based his sitcom Fawlty Towers on the hotel after visiting it while filming Monty Python's Flying Circus in 1973. According to the Metro, Cleese said the manager at the time, Donald Sinclair, was "the most marvellously rude man I've ever met", and based the famous Basil Fawlty character on him. Councillors in Devon were told at a meeting this week the hotel has ceased trading last month. Owners Oceana Hotels were disappointed that the plans for a retirement home were rejected and are now looking at their options, which could include opening again at Easter. Kevin Wood, managing director of Oceana Hotels, told the Daily Telegraph: "We always close it for winter for a varying amount of time, sometimes for a month, sometimes two weeks. "It is the slackest period of the year and it depends on what business there is in town. "We have found if we stay open, we don't make money. We are due to reopen for Easter." According to the Daily Mail, he added: "Staff were told in early December and we offered to transfer everyone to our Bournemouth hotels. "It is a difficult location to run a hotel being a mainly residential area and we have tried our best. "I think most of the residents are happy to have redevelopment here." According to the Express, Carolyn Custerson, chief executive of the English Riviera Tourism Company, said there was still some hope that the hotel could yet survive. She said: "With the turnaround in visitor numbers and with more marketing and some modernisation, I believe the Gleneagles could once again be a successful three- to four-star, boutique-style hotel." Sitting on the cliff path with lovely walks to both Ventnor and Sandown, the Hambldeon represents great value for money and tasty food, say reviewers. "Didn't want to leave - we'll definitely be back" says one. The hotel offers special walking breaks, escorted or unescorted. Visit hambledon-hotel.com. With most of the bedrooms boasting beautiful sea views, La Haule "exceeds all expectations," says one reviewer. Highlightsinclude a beautiful sunken garden and an outdoor heated pool overlooking the St Aubin's Bay. "Classy, stylish, friendly, down to earth and awesome" says one reviewer. Visit lahaulemanor.com. The Cherwood Hotel, just off the Esplanade, won both a Tripadvisor Certificate of Excellence and a Travellers Choice award last year. "We were made very welcome and can highly recommend." Visit cherwood-hotel.co.uk. This hotel was a Tripadvisor Travellers Choice Winner for 2013, and is singled out for its service. "We loved it so much that we booked again for the next two years as it is a very popular hotel. You only have to stay here to see why," says one reviewer. Visit lauristoncourt.com. This stylish boutique country house, nestled on the "idyllic" Exmoor coast, features ten cosy rooms, each with its own style and decor, offering an eclectic mix of contemporary and antique. The owners, Sam and Huw, "make hotel guests feel like old friends" say reviewers. Visit oldrectoryhotel.co.uk. Meander up a cobbled lane from the beach to find this lovingly restored "island gem": think rustic simplicity, charm and friendly service. "The accommodation could only be described as superb," says one reviewer. Another described it as "An amazing hotel on an amazing island." Visit Britain recently awarded the Elmdene five stars – and it also received an award for excellent breakfasts. It's 300m from the beach and boasts a lawned garden. With just six rooms, you'll need to book in advance. "Everything was great, the room the food and the service was possibly the best I have experienced from any hotel." Visit elmdenehotel.co.uk. 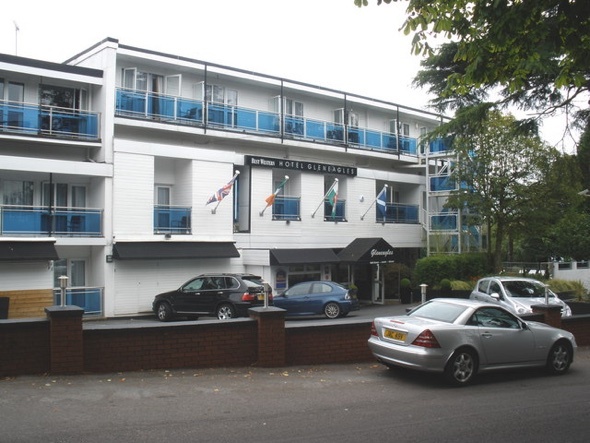 This seafront hotel has recently been refurbished, with highlights including a friendly bar and a sun lounge with sea views. It's described as "top class" and "immaculate" by Tripadvisor reviewers. A small hotel with a huge reputation, this Victorian seaside home which overlooks Llandudno's seaside promenade gets rave reviews all round. Sea view rooms are particularly recommended. Visit can-y-bae.com. How many of these lovely old British coastal towns do you recognise? Bet you can't name them all! This seaside town was voted one of the happiest cities in the UK, as well as the hippest. It boasts the UK's first electric railway, the world's oldest aquarium, a popular nudist beach, a famous pavilion and more than 400 pubs. Recognise it yet? This charming haven on Britain's 'sunrise coast' is famous for its iconic beach huts, lighthouse and award-winning pier. Rowan Atkinson and Bill Nighy are two of the increasing number of celebs who own second homes here, and the town's popularity among the chattering classes has led to it being dubbed 'Suffolk's least affordable town'. This resort on the south east coast is famous for its oyster festival. It was also home to the first steam-hauled passenger railway, which opened in 1830 and provided a route for travellers to and from London. It was fondly named the 'Crab and Winkle line'. This much-photographed bustling port and thriving cultural centre is set around a beautiful natural harbour and is surrounded by some of the most spectacular scenery in Britain. This well-known town on the south coast hosted the 2012 sailing Olympics. It's popular with modern holidaymakers, but this resort is believed to have been where the Black Death started in Britain in 1348 after two ships docked here carrying sick sailors. This small but perfectly formed seaside resort is built on a mile-long peninsula and boasts three sandy beaches which are very popular among locals and tourists in the summer.